To kick off summer, we’re sharing a new Gwaltney Great Dog recipe every week. 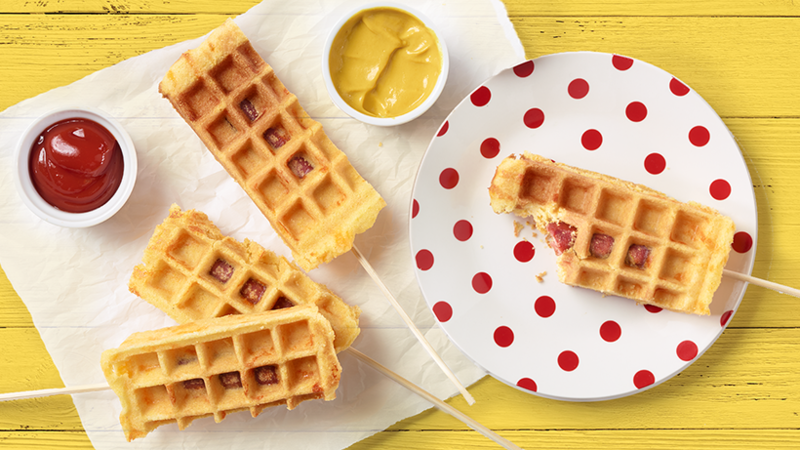 Let’s start with some Waffle Dogs. Never tried them? Today’s the day. Spray 8-inch electric waffle iron with cooking spray. Heat to medium temperature. Thread each Gwaltney Great Dog onto a wooden skewer. Set aside. Prepare corn muffin batter as directed on package. Mix 1 cup of cheese into batter. Place hot dog skewers on the grid of the waffle iron. Allow for ¾ of the skewers to hang outside of the waffle iron. Close lid and allow hot dogs to cook 1-2 minutes or until heated through. Remove from waffle iron and set aside. Spray waffle iron with cooking spray and spread half the batter onto bottom grid of the waffle iron. (Batter should not completely cover waffle grid) Place hot dogs into batter, keeping ¾ of the skewers outside of the waffle iron. Top hot dog skewers with batter. Close lid and cook 4-5 minutes or until waffles are golden brown. Remove waffle dogs from iron. Serve with ketchup or mustard.